Butler’s Pond, behind Central Middle School on Hancock Street, is a small pond with big turtles! Other fauna include bullfrogs, toads, herons, ducks, and fresh water shrimp. It’s an easy-to-access pond that’s fun to explore along the edges in warm weather or on skates in the winter. It is likely that this pond is a natural pond, not man-made like other ponds in the city, as there are historic references going back to the days of Thomas Morton. 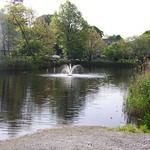 Ownership of the pond changed many times over the years. In 1634, it was owned by the Town of Boston. In 1775, it was taken in lieu of debts by Quincy City Authorities. Peter Butler, from whom the pond gets its name, purchased the pond and some of the surrounding land in 1872. In 1918, it was purchased by John W. Walsh. 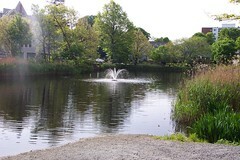 His son, John W. Walsh Jr., gave the pond to the City of Quincy in the 1980's, though the city didn't officially own it until the 1990s. Butler's pond once stretched across Merrymount Road. There are residents today that can still remember ice skating under the bridge or culvert that separated the two sections of the pond. A proposal to fill in the rest of the pond led to what the Patriot Ledger called the "War of Butler's Pond," which lasted decades. The school wanted to fill in the pond to make a playground, but local residents vehemently opposed it. Ultimately, the residents won, but the future of the pond will be affected by plans to build a new Central Middle School in a different location. Currently, the pond is used for environmental and scientific studies at both Central and the Woodward School, a private school just down the street from Central. Each school uses opportunities, such as Earth Day or Make a Difference Day, to do clean ups of the pond, but the pond needs more than a cleanup once or twice a year. Some of the pond's issues include advanced eutrophication; invasive species, like phragmites; and poor water and sediment quality. The above information was provided by Tom Scott, a founding member of the group, who did extensive research into the pond's history.